No Membership Necessary! No Tickets Necessary! 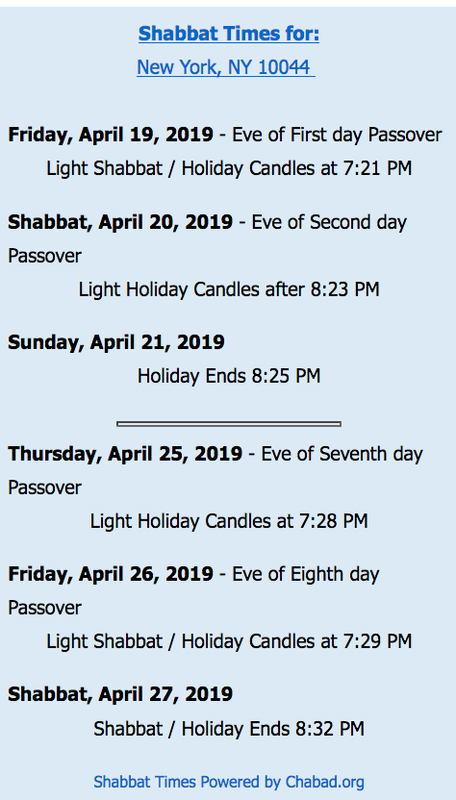 More information available at Chabad of Roosevelt Island web site. 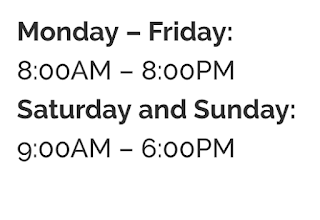 so be aware of a service change. 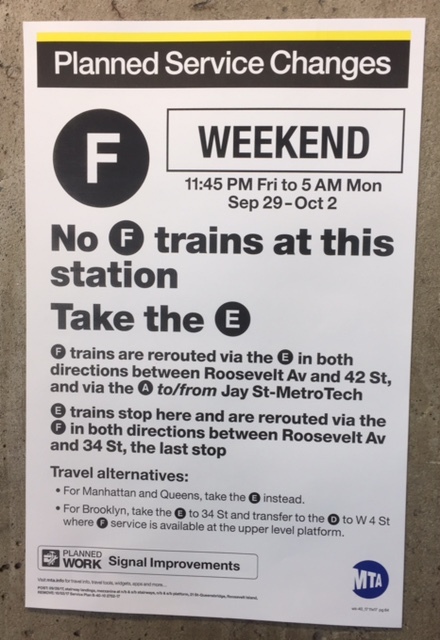 No F service at 21 St-Queensbridge, Roosevelt Island, Lexington Av/63 St and 57 St.
Also, have you noticed the new neighborhood map placed. in the Roosevelt Island F Train Station? 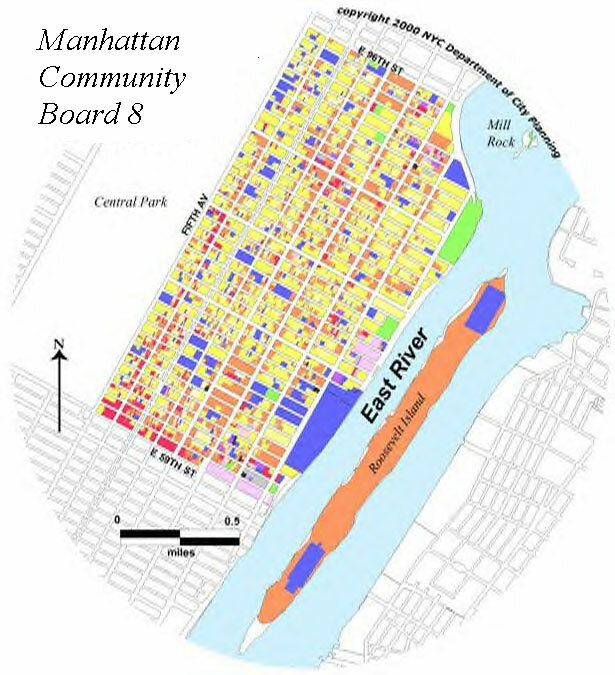 The Manhattan Community Board 8 Roosevelt Island committee met last evening chaired by resident Sharon Pope. 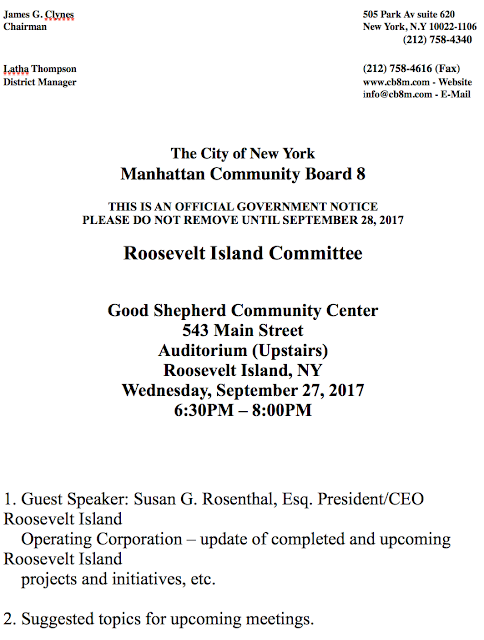 Roosevelt Island Operating Corp (RIOC) President Susan Rosenthal spoke to about 15 residents, including several new residents, about current Roosevelt Island infrastructure projects. Tram Platform renovations - work will soon be done on South Cabin Platform, Work will begin October 16 on North Cabin platform. On schedule to be finished by end of year. Seawall railing will be replaced, permits obtained, contract awarded, work will begin soon. Firefighters Field Nighttime Lighting as well as reserving playing fields for resident use. The next meeting of the Community Board 8 Roosevelt Island committee is Thursday October 19 at the Cornell Tech Bloomberg Academic Center - you're invited. 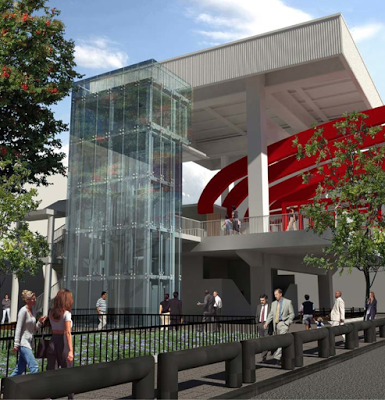 UPDATE 4:18 PM - Correction - I was just advised by RIOC that the Tram Station Elevator contract was not awarded yet. 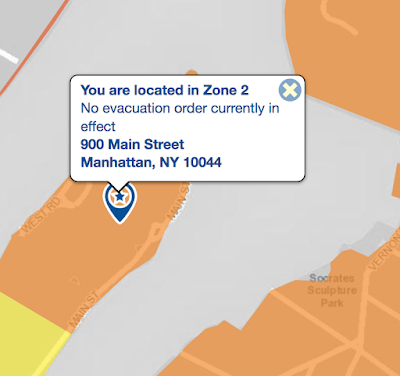 The New York City Office of Emergency Management (NYC OEM) wants you to be prepared and Know Your Hurricane Evacuation Zone. Hurricane Sandy left an indelible mark on the minds of all New Yorkers, but especially for the residents that experienced some of the storm’s most devastating impacts. 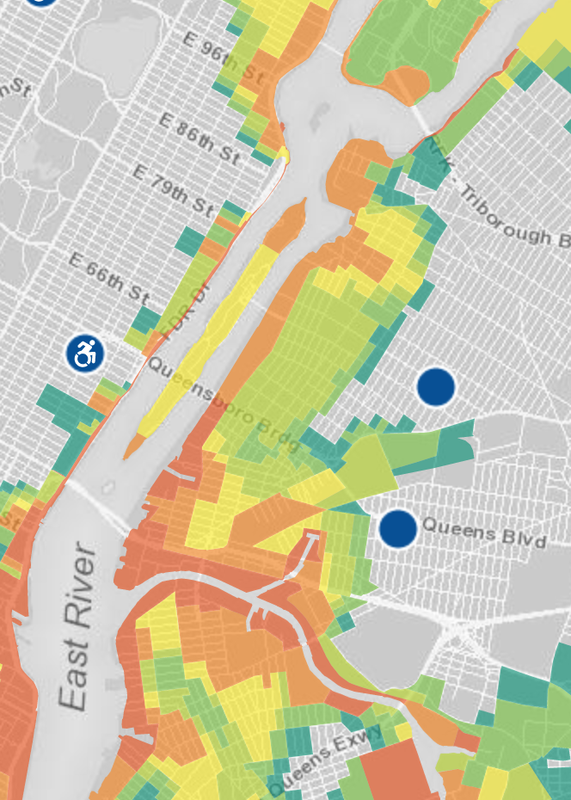 New York City’s geography makes it especially vulnerable to wind and flooding. With sustained winds of more than 74 mph, hurricanes can flatten homes, topple trees and turn loose objects into deadly projectiles. Storm surge, the “dome” of ocean water that is pushed ashore by the winds and low barometric pressure of a hurricane, is the most serious hurricane-related hazard. And a storm’s driving winds and torrential rains can cause massive and dangerous flooding in low-lying and poor-drainage areas. To ensure that New Yorkers are prepared for the 2017 hurricane season, which runs from June 1 through November 30, the New York City Emergency Management Department is urging everyone to take steps to be ready if a storm approaches. 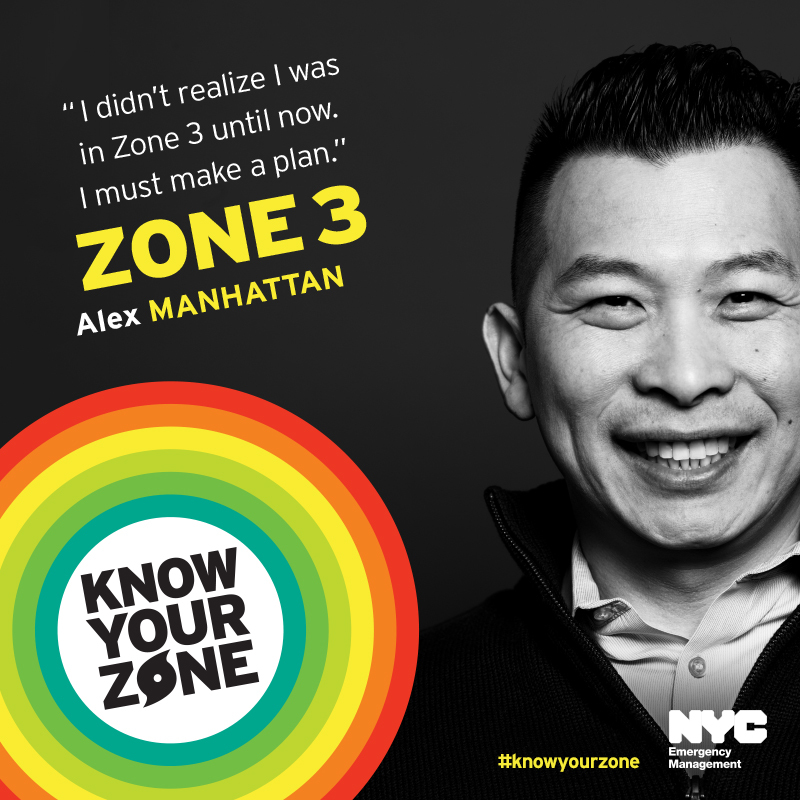 Roughly three million New Yorkers live within the city’s six hurricane evacuation zones, which were revised in 2013. Hurricane evacuation zones are based on coastal flood risk resulting from storm surge, the geography of the city’s low-lying neighborhoods, and the accessibility of these neighborhoods by bridges and roads. The City may order residents who live in a zone to evacuate depending on a hurricane’s forecasted strength, track, and storm surge. If you are ordered to evacuate as a storm approaches, do so as directed. 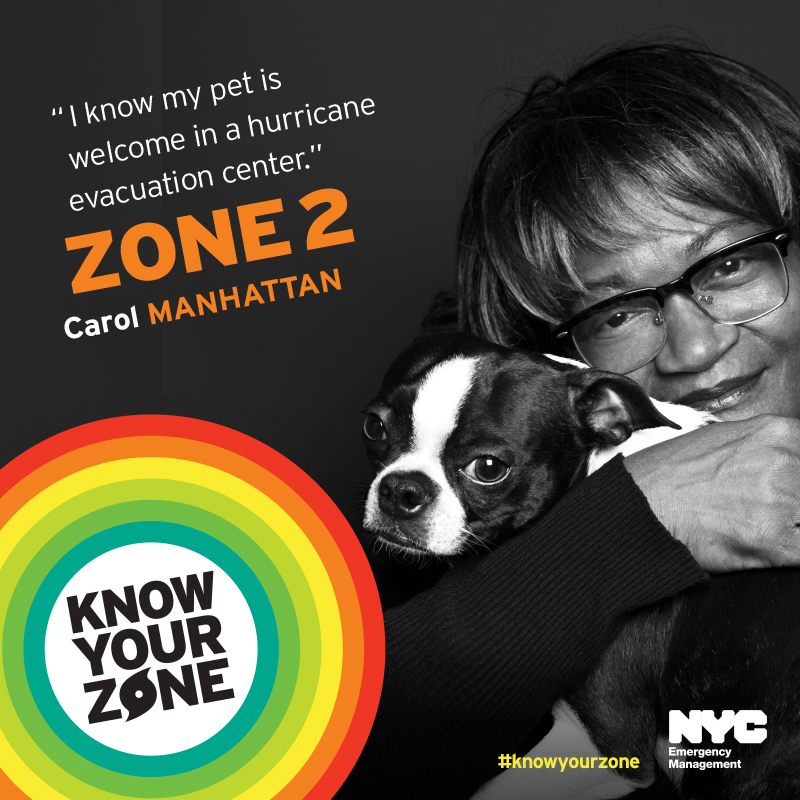 Know Your Zone – Find out whether you live in one of the City’s six hurricane evacuation zones by using the Hurricane Evacuation Zone Finder or calling 311 (212-639-9675 for video Relay service, or TTY: 212-504-4115). If you live in a hurricane evacuation zone, have a plan for where you will go if an evacuation order is issued for your area. The City strongly recommends that evacuees stay with friends or family who live outside evacuation zones. For those who have no other shelter, the City will open evacuation centers throughout the five boroughs. Consult the Hurricane Evacuation Zone Finder or call 311 to identify which evacuation center is most appropriate for you. Make a Plan – Make a plan so you know what to do, how to find each other, and how to communicate if a hurricane strikes. Stay informed – Sign up to receive emergency updates and information online and via e-mail, text, phone, and Twitter through the City’s free Notify NYC program. 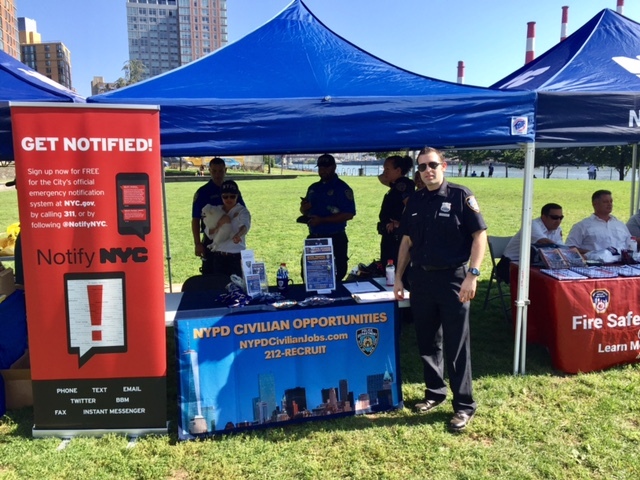 Visit NYC.gov/notifynyc or call 311 to sign up. Visit the NYC Know Your Zone website at NYC.gov/knowyourzone or call 311 for more information about the city’s hurricane evacuation zones, hurricane hazards, and tips to prepare for storms. including all of the residential buildings and Cornell Tech campus, are located in Zone 3. Lighthouse and FDR Four Freedoms Park are located in Zone 2.
with your family, friends and neighbors at the Roosevelt Island Jewish Congregation’s Yom Kippur services. At the RIJC, the oldest and longest-serving Jewish congregation on the Island, you will find members of all generations worshipping as a progressive, egalitarian and friendly community. Our spiritual leader, Rabbi Leana Moritt, has established a special warmth and, after 10 years here, knows every member and their family. Kol Nidrei services begin Friday evening, September 29th at 6:15 pm sharp, in the Samctuary in the Cultural Center, at 548 Main Street, down the stairs marked Main Street Theatre & Dance Alliance. Barrier-free access via elevator is also available through the breezeway at 556 Main Street. Yom Kippur Morning services will be held on Saturday, September 30 at 9:00 am. 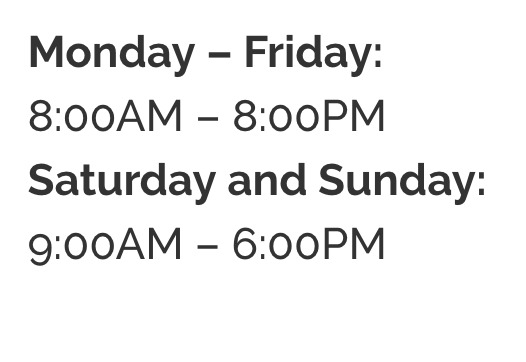 Child care is available for children ages two to ten Friday evening and during the Saturday morning and afternoon services. There will be a children’s service in the Theatre on Saturday, September 30 at 11:00 am. 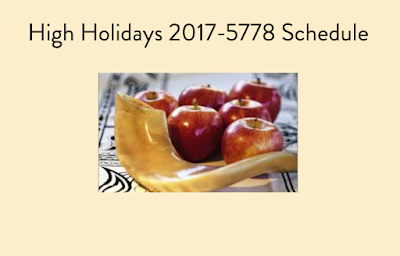 The Afternoon services, including Havdalah, will begin at 5:00 pm, followed by a light Break Fast. For more information about the High Holidays, worship services and programs throughout the year, please visit RIJC.org for details. 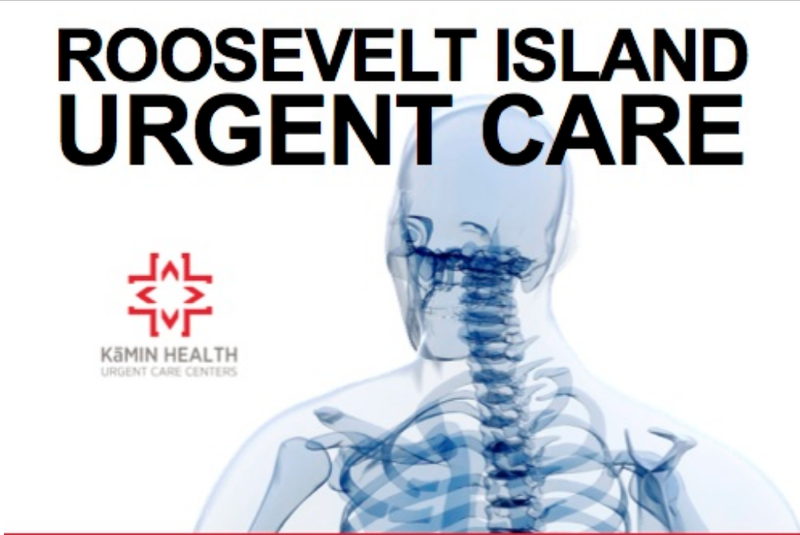 You may call Nina Lublin, RIJC president, at 212-688-0003. We look forward to seeing you for Yom Kippur. 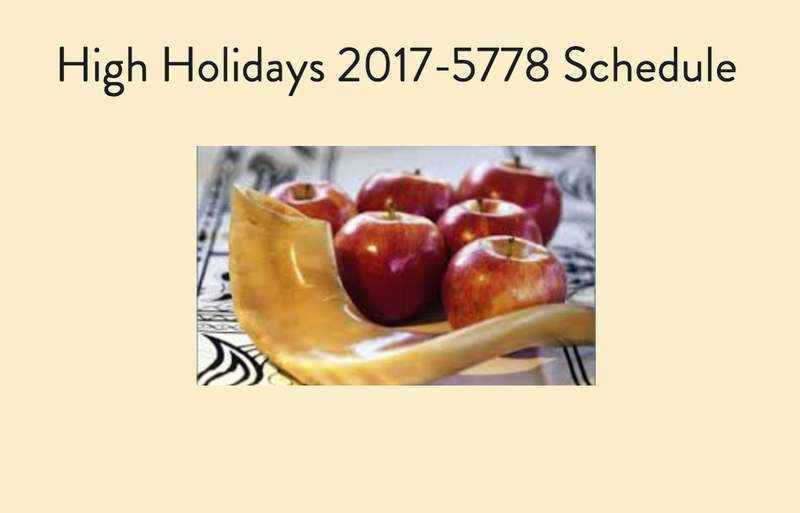 Shanah tovah u’metukah. More info on the RIJC available at their web site. 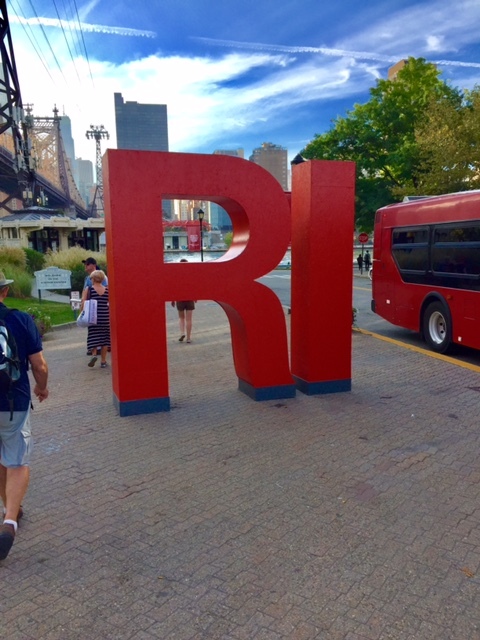 Will Hudson Companies Giant RI Welcome Monument Sculpture Be Welcomed On Roosevelt Island - Fun, Fanciful, & Whimsical Or Ugly Unnecessary Pedestrian Obstacle? 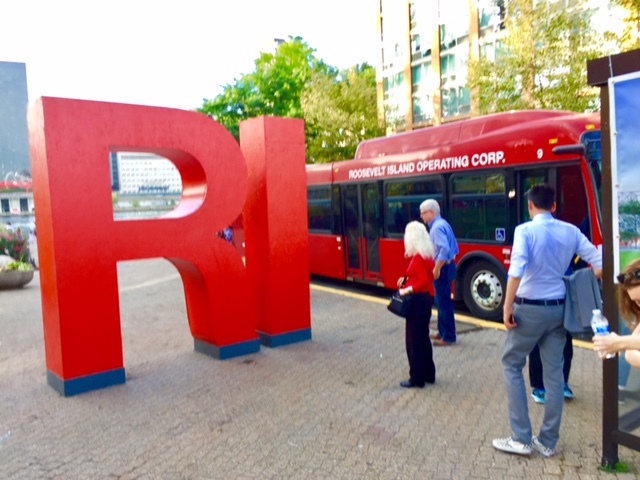 After noticing the placement of the RI monument was obstructing pedestrian access to the Red Bus, the mock up was moved closer to the Tramway Plaza lawn. Hudson Companies representative Alex Kaplan describes the purpose and plans for the RI Welcome monument wayfinding signage emphasizing the mock up is not a final version and there will be adjustments to the RI monument material and color. 1 - The rumor that the South Dog Run will relocate to the field in front of the tram station is not true. 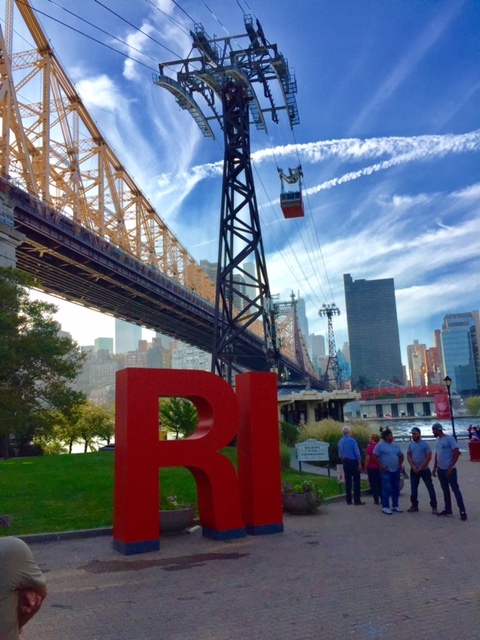 In fact, RIOC is installing an “I ❤ Roosevelt Island” statue there for tourists to pose in front of. 2 - However, the South Run will definitely move. I don’t have a time frame on when. It depends when construction begins on the two new SouthTown buildings. 3 - Until the South Run moves, emphasis on improvements will be placed on the North Run. Upgrades to the existing South Run are unlikely unless it’s determined that construction on the new SouthTown buildings will not begin for more than one year into the future. 4 - Mary welcomed our input for suggested locations where to move the South Dog Run. 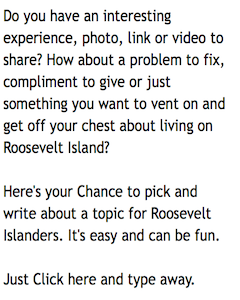 I sought your input and got some good ideas back from you. I scouted locations around SouthTown, shot photos and wrote up a report of 7 potential locations. Mary and I are planning a walkthrough together within the next two weeks. Posting of signage with dog run rules. Mary has provided me a draft, and I am working with her on the language and content. Gates will be relocated from corners to sides. This will prevent dogs already inside the Run from cornering dogs who are entering. It will decrease the probability of fights breaking out when new dogs enter, and it will relieve stress for anxious dogs. 6 - More expensive improvements, such as running water, will take longer to achieve. RIOC used the phrase “down the line.” I asked for some clarification, and it was explained to me that the 2018-19 RIOC budget has already been approved. If we want funding for running water, we’ll have to start lobbying RIOC in January 2018 for the 2019-2020 budget, which will be finalized in May/June 2018. It’s unclear which category (expensive or do-able) some of the other improvements on our list fall into - including new landscaping and a change to to the base/floor of the Runs (from dirt to a kind of gravel or pebble-base). Mary did say she’s doing research into “decomposed granite” and pebble bases, so it’s possible those changes could come sooner than the 2019-2020 budget. 7 - Grass inside the dog runs will be mowed regularly. RIOC recently purchased new mowing equipment with more flexibility to maneuver in small spaces/tight corners.If you see the grass become too tall (or you notice other problems or have any complaints), you should either email info@rioc.ny.gov or look for the “fix it” link in the middle of this page on RIOC’s website. Both methods are monitored throughout the day. Sometimes it may take a while for Mary to get a firm answer from RIOC higher ups in order to answer you, but she says this method is faster than tweeting @riocny. Here are Roosevelt Island Southtown Dog Options prepared by Mr.Piro. I don't think the boat was looking to dock at the new Roosevelt Island ferry dock. 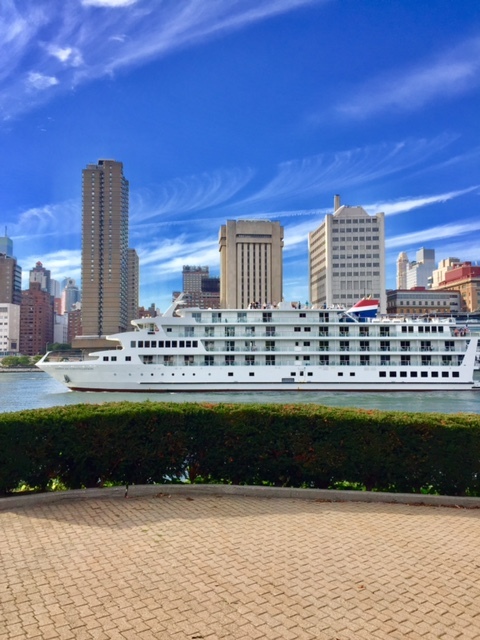 More on the American Constellation river cruises here. 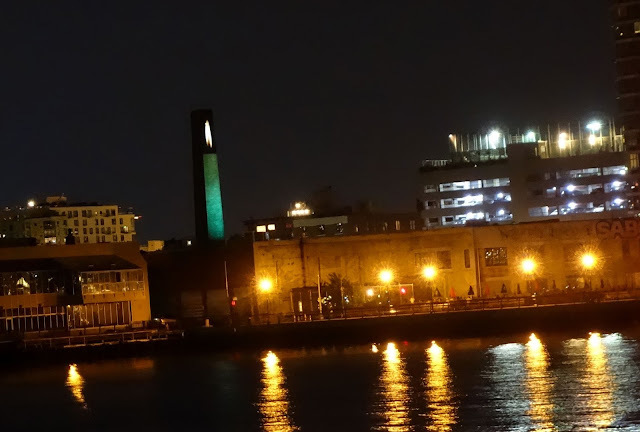 Have you noticed what looks like a brightly lit candle flame flicker across the East River from Roosevelt Island in Long Island City and wonder what it was? 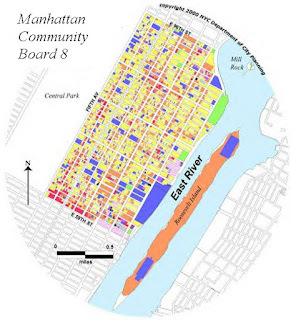 ... represents the Upper East Side of Manhattan and Roosevelt Island. 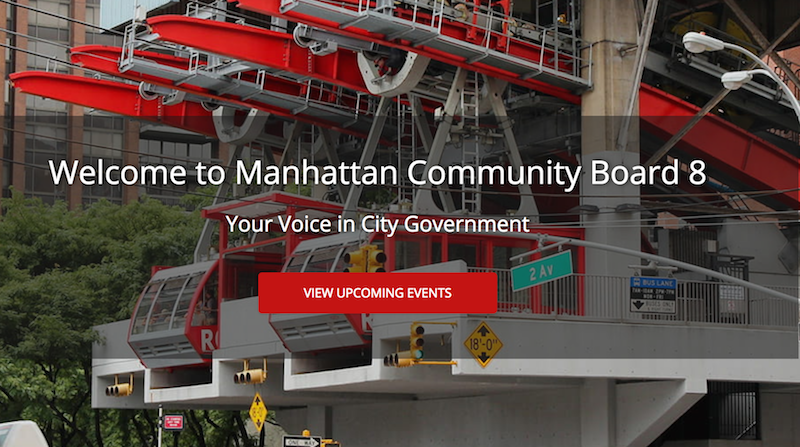 CB8M is comprised of 50 volunteer members who serve as advocates and service coordinators for the community and its residents, as well as help citizens resolve municipal service delivery complaints. 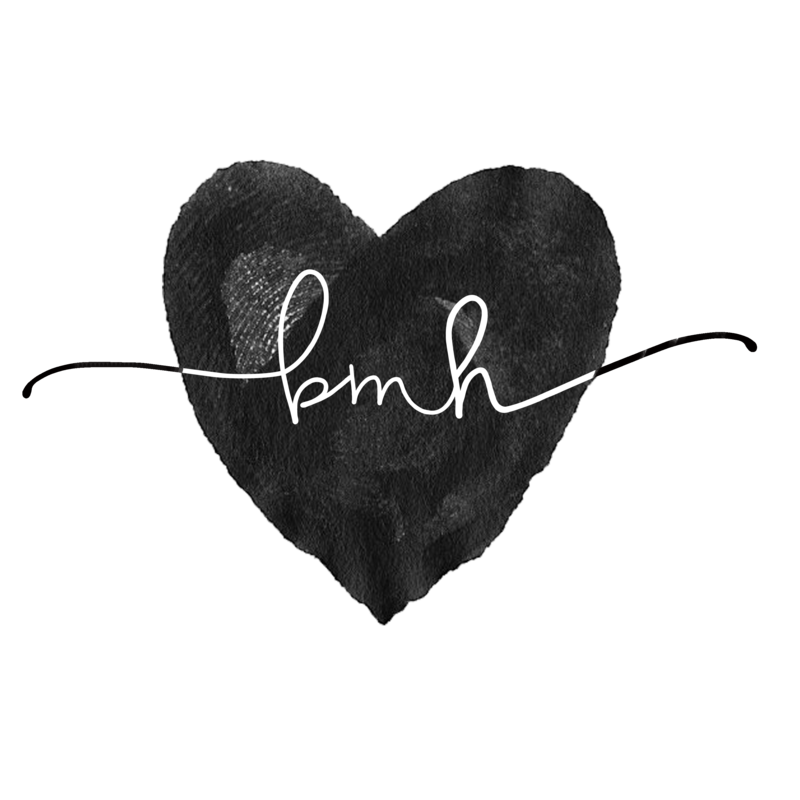 More info on CB8M available at their web site. Thought Roosevelt Islanders might be interested in this – a friend of mine, Jay Aston, is the singer of an internationally known British rock band named Gene Loves Jezebel. He is staying with me here on Roosevelt Island this month, and he has set a new Gene Loves Jezebel song to a video he took from the Roosevelt Island tram and put it up for fans to see. Here's the Roosevelt Island Tram evening ride video with music from Gene Loves Jezebel new album, Dance Underwater. Jay Aston will be playing a NYC gig Wednesday September 27 at Berlin. I was talking to a very old friend of mine, a native New Yorker the other day & he was stunned to hear that Roosevelt Island was inhabited! With Cornell Tech arriving, I don’t think it’ll be a secret for too much longer. A real refuge from & yet, very much a part of this grand city. A magical place. It has ghosts..
Falls Prevention Week is the last week of September! 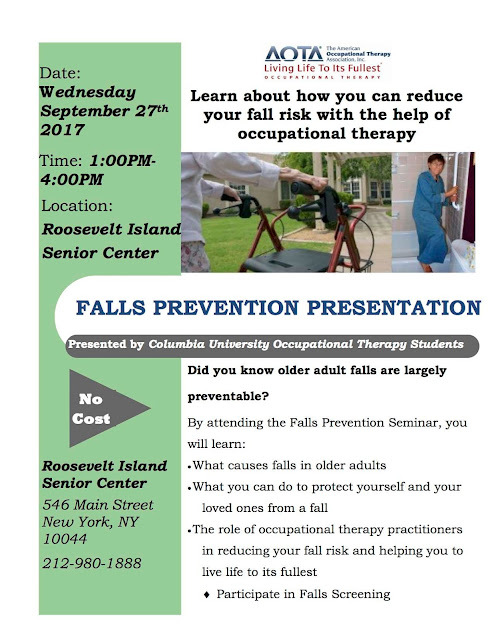 Join students from Columbia University for a Falls Prevention Event! Students will be showing a presentation on falls & doing screenings. This event will be held from 1:00pm until 4:00pm. We will be headed on another field trip today! 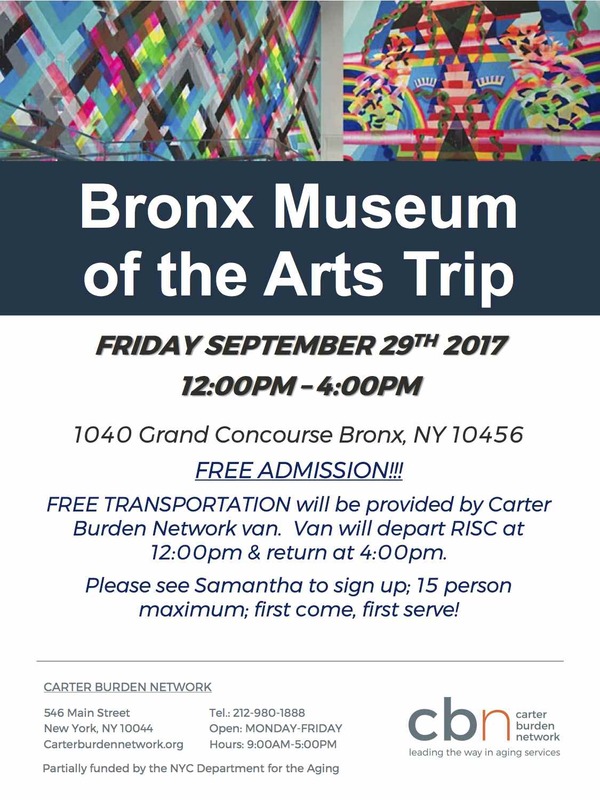 Please join us on a trip to the Bronx Museum of the Arts. Transportation will be provided for free by Carter Burden Network via the CBN Van. We will depart RISC at 12:00PM & return by 4:00PM. Please see Samantha to sign up! Lisa Fernandez is the Carter Burden Network Roosevelt Island Senior Center Director. More information on the Carter Burden Network and the Carter Burden Roosevelt Island Senior Center available at it's web site. 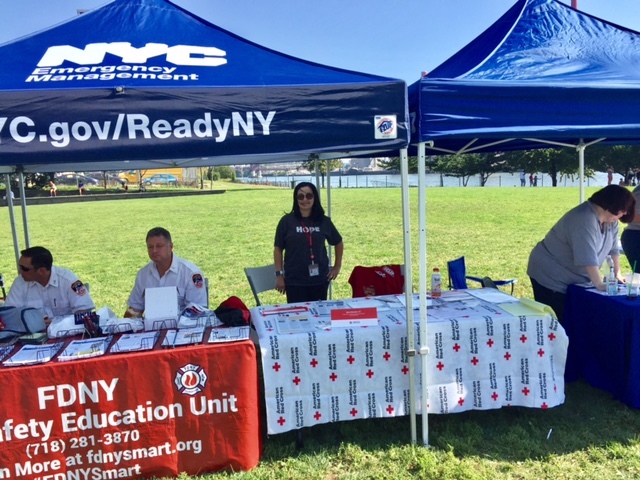 The NYC Office of Emergency Management (NYC OEM) sponsored NYC Runs Roosevelt Island Squirrel Stampede 5&10K race on Roosevelt Island yesterday. 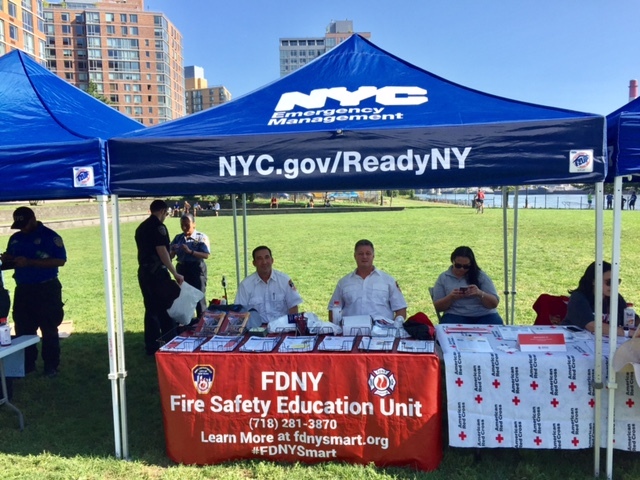 ...The preparedness fair will feature tips and information about preparing for hurricanes, how to make an emergency plan, how to pack a Go Bag, and more. 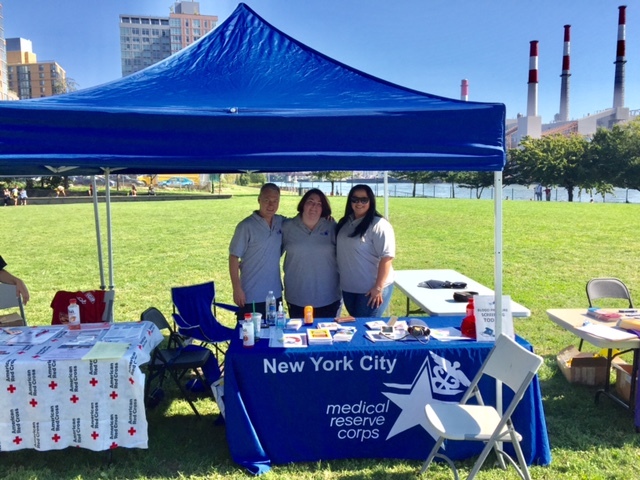 and organizations provided tips and resources for you to prepare for an emergency. The NYPD had info on civilian jobs opportunities. The FDNY instructed on Smart Safety tips. Red Cross on preparing for emergencies. 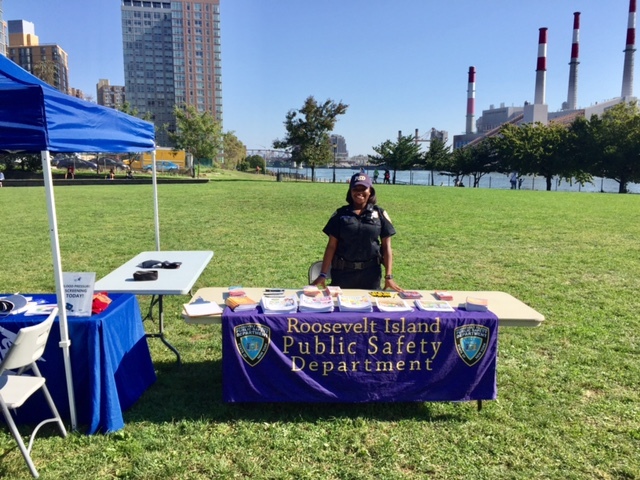 our very own Roosevelt Island Public Safety Department had preparedness info as well. 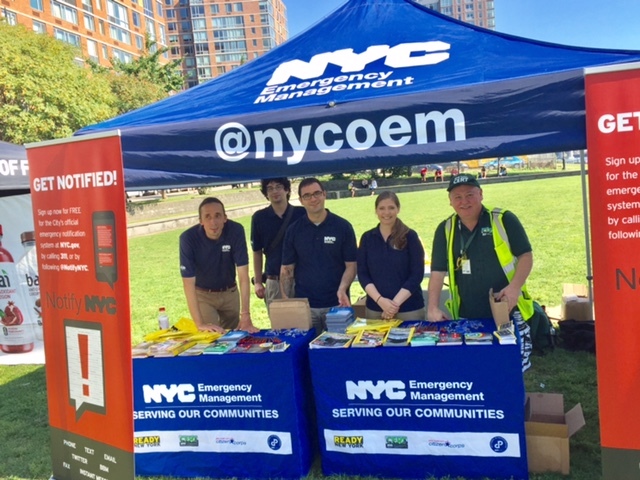 The NYC OEM will be having a Roosevelt Island Emergency Preparedness Town Hall in October - the date to be announced. The new Roosevelt Island Cornell Tech school has not only attracted residents, tourists and Tech Leaders to it's beautiful new campus, but a large number of Canadian Geese appear to have found a new home there too. Here's just a few of the Geese I saw on the Cornell Tech campus last Saturday. Well, thought you could use a good laugh tonight -- and please do not get mad at either the driver or me. Everything we did was careful & safe. Coming north on the West Channel Rd just north of Southpoint Park & before the Cornell Cafe, the road was blocked by about 15-20 or so of the biggest Canadian geese I've ever seen on RI. Our driver slowed to a crawl, then stopped completely, & honked his horn gently a few times, but the geese would not budge to either side. He then carefully stopped the bus, I jumped off & started shooing them to one side. Easier said than done. But after about 2 minutes, I cleared the roadway, got back on the bus, he thanked me& we proceeded. It being RI, of course there were visitors on the promenade watching & taking pix w. their phones, but not helping. I may be somewhere in the Twitterverse -- or worse. Also, be careful where you walk on the Cornell Tech campus grounds, particularly the hilly meadow area - goose droppings everywhere. 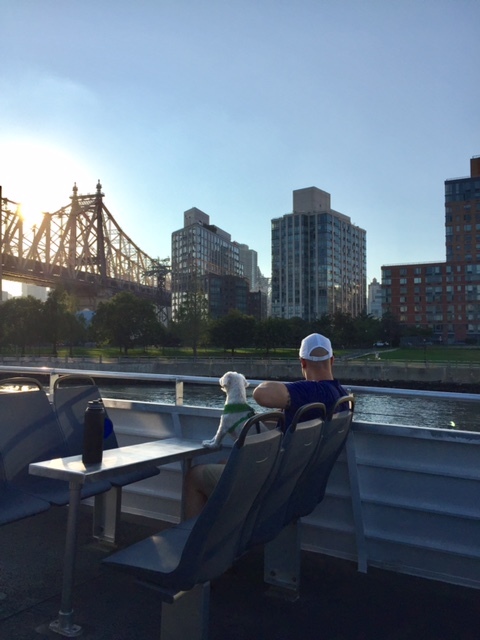 Have you taken a ride on the new Roosevelt Island ferry service yet? 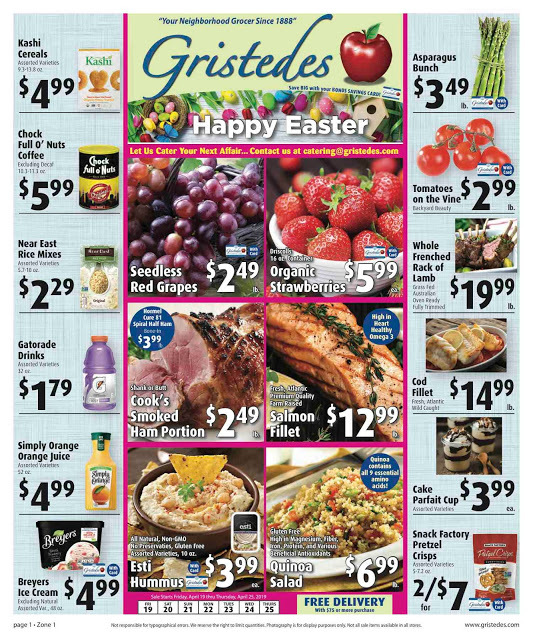 It's fantastic and the best $2.75 you'll spend. All you have to do is sit back and enjoy the view. 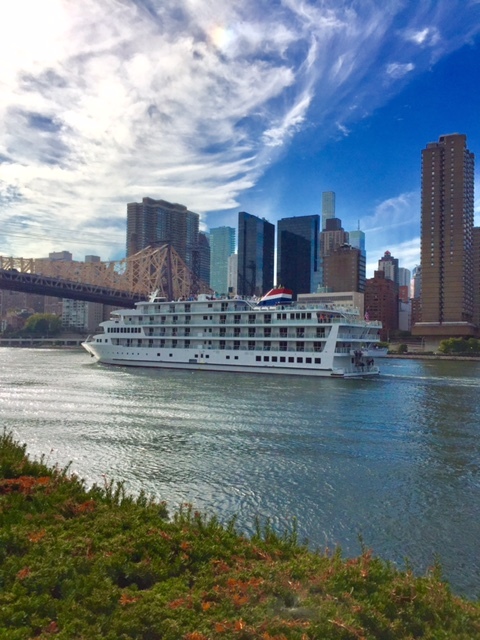 from Roosevelt Island to Astoria. After a ten minute walk from the Astoria Ferry dock, I stopped in to the Astoria Craft Bar & Kitchen for a little Green Bay Packer football watching and Cider. The new East River Ferry service makes it alot easier to check out many of the excellent restaurants and bars in Astoria and Long Island City.